Again and again people ask us what is special and why they should buy their propellers just here. Very simple. 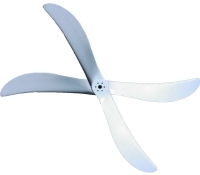 We sell reliable products, we have experience of almost three decades in manufacturing propellers and do not need any commercial tricks to sell pseudo-scientific marvels to you. You can take it from me: 99 % of what is offered as a world first in manufacturing propellers was already known 50 years ago or even earlier and has just been rehashed for a new generation of pilots who have not yet been born back then.